Until now there has been little robust research undertaken to understand what is needed to make a community business a success. With the challenging trading environment of the last few years, the pressures of the financial crash, significant reductions in funding for public services, and stagnant wages, simply having a laudable purpose and an optimistic outlook is not sufficient to create and sustain a successful community business. NatCen Social Research and WPI Economics have recently published three research reports, commissioned by Power to Change, focusing on what makes a successful community business in the housing, transport and pubs sector. Findings are based on four in-depth case studies conducted with successful community businesses in each sector. According to the research, there are three broad categories of success relating to the business, community and place. Over the next three weeks we will visit each success category and explore the similarities and differences between each sector in focus. But first, here are the overarching findings from the research. As well as exploring success, researchers also asked community businesses what they felt defined them as a community business. Their view was that community businesses aim to benefit local people by providing goods or services that might not be available from either commercial providers or those in the public sector. Unlike other socially-focussed enterprises, however, it was their connection to the local community that defined them. This connection was embodied in a whole range of ways, from financial investment in the business, to working for it in a volunteer or paid capacity, to being a customer. And often, any one member of the community might have been involved in many different ways. It is this vital, living connection with the community that meant community businesses were able to do more than just provide a product or a particular service. Community businesses felt that they helped to strengthen the fabric of the local community, through making connections between people, increasing skills and supporting social and cultural renewal. 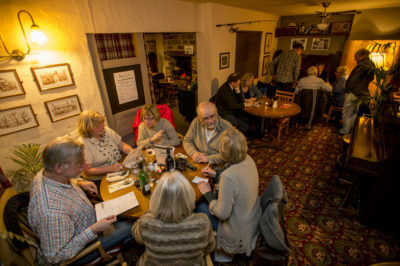 While the connection to the local community and their social aims were what made community business distinctive, they are nevertheless still businesses. Like other businesses, they need to market and sell their products and balance their books if they want to survive. The research found that community businesses came up against many of the pressures that other businesses face, such as having to identify and meet demand, raise funding, cope with changes to their operating environment, and address the challenges of finding and retaining people with the skills the business needs. At the same time, many of the strategies they needed to employ to meet these challenges were the same as other businesses, including robust business planning processes; being open to change and diversification; having committed, enthusiastic and resilient leaders, and developing links and partnerships with other organisations. Despite the evident similarities, community businesses are distinct from their commercial counterparts in a number of ways, which brings both advantages and disadvantages. Successful community businesses have to find a balance between being commercially successful and adding social value. Community businesses have to operate in a way that generates sufficient revenue for the business to survive, at the same time as meeting their goal of adding social value. In some instances, this precludes them from taking decisions that would maximise their profits, as commercial businesses would, such as ceasing to operate non-profitable transport routes or no longer operating non-profitable services or facilities in pubs. Volunteers make community businesses viable. Weighed against the disadvantages of being a non-commercially-focussed enterprise, there are a range of benefits that their status and socially-based aims give them. Though there are disadvantages to relying on volunteers, fundamentally the fact that they do not need to be paid enables the community businesses to be viable, something particularly apparent in the transport sector but nevertheless important across all of the community businesses we spoke to. Linked to this, is the degree of community buy-in that the businesses are able to achieve. Community businesses rely on, but are also able to achieve, a level of community buy-in that is much more difficult for commercial organisations to generate. This is seen in the support for community businesses to take over seemingly non-viable pubs and help ensure that they become viable, and when persuading local residents to not oppose plans for housing developments. Community buy-in along with the socially-focussed aims of a business facilitate local institutional buy-in and support. For example, when community businesses in the housing sector are sold land below market rates or the help community-owned pubs and transport businesses receive from local authorities or sectors bodies to navigate statutory rules and regulations. And though community businesses want to be sustainable without grants and subsidies, there are undoubtedly times when local institutions are crucial to supporting the business and it is highly unlikely that they would have been available to commercial organisations in the same way. The socially-focussed nature of community businesses also means that they are able to generate significant commitment and enthusiasm from those who work for and with them. Working with or for a community business is not simply another relationship with another business or another job. It is something that people believe is valuable and worthwhile in its own right, irrespective of any gains they as an individual or other organisation may get from the relationship. It is this intangible advantage that may be community businesses most important asset. While the research targeted businesses that had achieved success, in such that they were running a pub, delivering a transport service or had built houses, there was recognition that success was a target that was continually moving. The businesses themselves applied stricter criteria than service delivery; they believed they needed to be both financially stable and able to meet their social goals. Achieving one without the other was just not sufficient for the businesses to feel successful. Overall this judgement neatly encapsulates the twin pressures the businesses are under and the duel goals they are trying to achieve.